The control of invasive species dispersal became particularly important due to globalisation of human activities, which facilitates species migration and contributes to substantially increase the number of non-native species. In Europe, the Water Framework Directive and the Regulation 1143/2014 on invasive alien species, requires that all the European countries monitor their freshwater and marine ecosystems and coordinate their actions against invasive species. There are about 1500 inland and marine AIS that have been identified by the Delivering Alien Invasive Species Inventories for Europe (DAISIE). The AIS monitoring in Europe costs about 50 million euros, however, it is widely accepted that these expenses will increase in the coming years. ID-Gene proposes two approaches to detect AIS in eDNA samples. The two approaches differ by taxonomic range of DNA barcodes and technology used to obtain molecular data. In NGS-based approach, a broad range of taxa is sequenced using high-throughput amplicon sequencing and the sequence data are screened for the presence of targeted species. In target eDNA tests, the specific probes are designed for targeted species and applied to eDNA samples, using a multiplex detection platform. The effective monitoring depends on early detection and accurate identification of invasive species. At present, visual observation remains the main source of information about the presence/absence of species in a given ecosystem. There are various conventional methods to detect invasive species, such as electric fishing, kick net sampling, etc., depending on targeted taxonomic group. However, most of these conventional methods are not very efficient for detecting low abundance species, such as invasive species at the early stages of invasion, or small populations of reintroduced species. Moreover, once collected the species have to be correctly identified, which is particularly problematic in the case of closely related, morphologically similar native and non-native species. In general, the routine use of morphological identification system cannot answer the increasing demand for biodiversity assessments, which require more rapid and standardized methods for species identification. 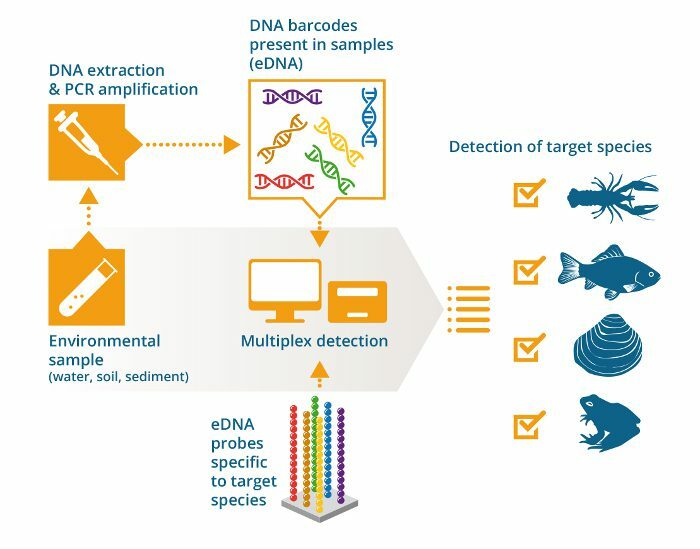 The environmental DNA (eDNA) monitoring consists in analysing DNA isolated from water or sediment samples in order to detect whether particular species are present in the surveyed ecosystem. The eDNA approach is based on assumption that each species leave DNA traces in the environment and that this extracellular DNA remains preserved in water and sediment for a certain period of time. The eDNA surveys allow identifying species using their unique DNA sequences, called also DNA barcodes. The main advantage of eDNA is the possibility to use it as an early warning about the presence of invasive species, which is of key importance for monitoring programs. Most of practical applications of eDNA in aquatic ecosystems concern the detection of invasive amphibians and fish, some of them of very high economic importance. However, the eDNA can also be used to detect invasive macro-invertebrates, plants and microbial species. interested in applying our AIS Survey to identify and inventory the diversity of selected groups or to detect particular species ?